8 ft. X 24 ft. Black Greenhouse Not all greenhouses are built the same and the Monticello line of greenhouses by Riverstone Industries proves this to be true. Constructed from the highest quality extruded aluminum (US grade) and electrostatically painted Black (containing 0.0% lead), our greenhouse uses on average more than 40 lbs. more aluminum than the average imported greenhouse. Why is this important? The weaker the framework the less snow the greenhouse can hold in the winter time before collapsing and the easier it is to get damaged by the wind. 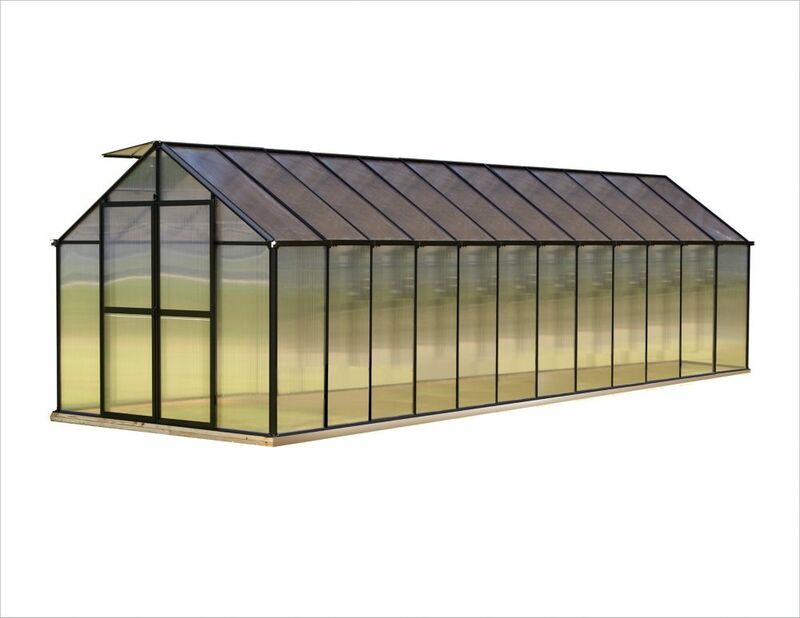 While most hobby greenhouses use less expensive thinner walls and roofing materials, the Monticello uses professional grade 8mm twin wall polycarbonate. This acts as a double pain window keeping cooler air in during warm months and insulating the greenhouse from cold air in the wintertime; making the Monticello more efficient to grow in for a longer period of time and adds to the efficiency of growing. 8 ft. X 24 ft. Black Greenhouse is rated 5.0 out of 5 by 2. Rated 5 out of 5 by Haley from Easy to understand directions and assemble. Holds up nice in winter months - specifically over th... Easy to understand directions and assemble. Holds up nice in winter months - specifically over these past few weeks of back to back snowstorms. Rated 5 out of 5 by Alexis from Really 4.5 stars This is a top of the line greenhouse; however it takes some serious concentration and work to assemble. We did have some confusion in the beginning assembly due to a change in construction not updated in the manual. We did call customer service twice, and received good support. My only complaints are (1) the anchors, which are worthless and (2) the doors, which are tightly spring-closed and do not allow partial opening for air flow without something heavy propped up against them. For now, I've taken the springs off altogether. Sliding doors would have been better. Please consult with your local municipality as each municipality has different requirements . There is a manual on this product page you can use as supporting documentation.